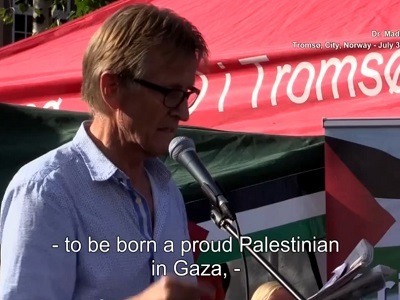 Mads Gilbert: "Nobody wants to be occupied!" BRAVO!!!!! let’s boycott ISrael and the US together until the bombings stop! Thank you for your service Honourable Gilbert, and thank you for being a true humanitarian. Your understanding of the situation is very clear. Do not look at the countries surrounding Israel. Because then you see which countries and groups who are demoniac and evil. Do not forget the terror groups in Gaza not to use the Palestinian children and women as cannon meat for the deception of the West. While the children of their leaders, if they are ill be be brought to Israeli hospitals for recovery. How evil is Israël then considered by their leaders?